The first phase of Hull’s transformational £25million public realm project, designed by public realm specialists Re-form Landscape Architecture, has completed in time to mark the start of the UK City of Culture 2017. Thousands have already flocked to the city centre to enjoy the cultural celebrations and images of the revamped streets and spaces are being beamed across the globe, giving the city a new lease of life and creating a legacy that will benefit Hull for years to come. Working alongside engineering and design consultancy Arup, Hull City Council and construction consultancy, Gardiner and Theobald, Re-form has designed and delivered the first of two phases of the complex city-wide public realm improvements. The project will transform how people use and perceive the city, and weaves Hull’s rich heritage into the fabric of the city. 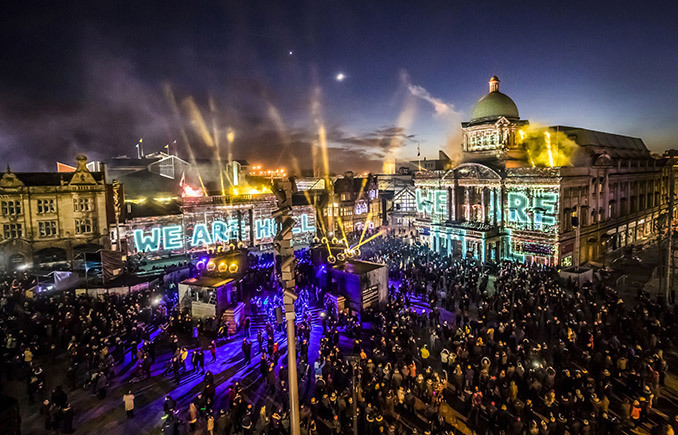 The revitalised public realm, which includes 14 streets and 4 public squares, has already played host to more than 342,000 people who descended on the city for the ‘Made in Hull’ launch event at the start of January which saw the story of Hull projected onto key buildings across the city. 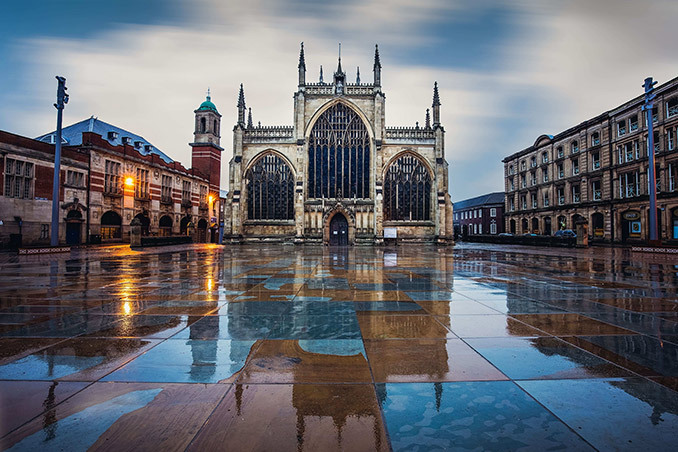 Re-form, which has offices in Leeds and Manchester, has designed public spaces which reflect Hull’s history whilst creating a modern, city landscape which will facilitate Hull’s aspirations of becoming a world-class visitor destination. Hull’s transformed city streets and public squares played host to more than 340,000 people for the Made in Hull launch event in January. Credit Press Association. – Trinity Square, home to the Grade 1 listed Trinity Church. The square has been brought together by removing the old church wall, creating an elegant setting for the intricate church façade. re-form also worked with the church architect Bauman Lyons, to create a tracery that is influenced by patterns in the church ceiling. These designs have been copied into base of the newly installed benches which are positioned so that the pattern can be viewed as visitors approach the square from surrounding streets. 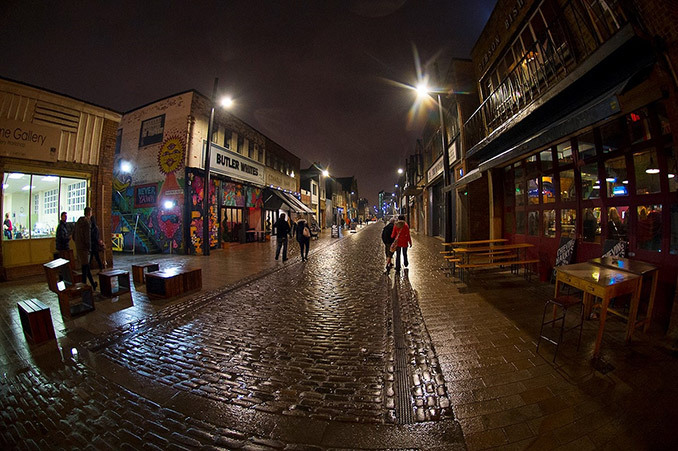 – In the historic Fruit Market quarter, the original basalt cobbles have been cleaned and re-laid on Humber Street and Humber Dock Street. The basalt harks back to Hull’s historical docklands as the material was used as a ballast on ships in the 18th and 19th centuries and is a feature of many of Hull’s streets. – Original tram tracks that formed part of the rail network around the city have been excavated, cleaned, re-cut and laid back in their original positions along Humber Dock Street as part of the new street design. New seating on the street evoke images of when the area was a thriving fruit market, designed as clusters of stacked crates. – A new pedestrianised artery has been created through the city from the train station in the west to the civic heart of the city, the historic old town and the docks. Three key shopping streets have been re-designed as public spaces, providing places for people to spend time in an attractive environment. This will encourage people to spend longer in the city centre, thus supporting the local economy and creating a more vibrant, enticing urban centre. – 58 mature trees create shade and colour throughout the city centre. The trees were hand-picked from a specialist nursery. 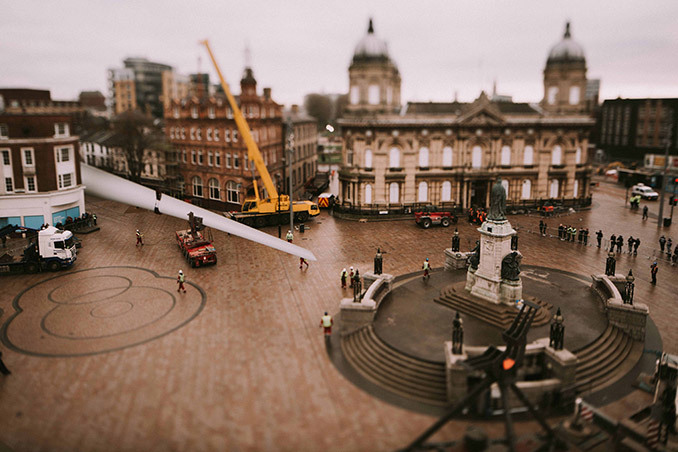 A 75-metre-long Blade sculpture is installed into the recently rejuvenated Queen Victoria Square in Hull. Credit Thom Arran. Phase two of the project will be completed by Easter and will include the revamped Beverley Gate – a historic site made famous as the location where King Charles I was refused entry to Hull in 1642, one of the events which sparked the English Civil War. New seating for up to 160 people is currently being installed in Queen Victoria Gate, the city’s main civic square, and takes inspiration from the ribbed structure of fishing boats, creating a sculptural form that wraps around the northern end of the space. Re-form has also been working with several artists on specially commissioned light installations, water features and sculptures that will are being installed in public spaces across the city and will be unveiled in the spring. These include a series of circular fountains in Queen Victoria Square along with eight ‘mirror pools’ in Trinity Square, designed by artist Mel Chantrey, a former Turner-prize nominee.